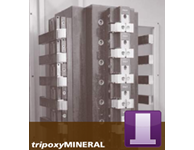 tripoxyMINERAL | Advanced Machine & Engineering Co.
Triag tombstones are made of epoxy mineral casting making them lighter than aluminum in specific weight. This material greatly reduces vibration, guaranteeing high accuracy in your machining, even when using the upper end of the tombstone. Metric Spacing.